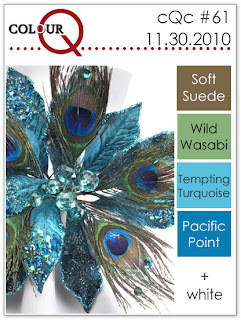 It's time for a fresh colourQ colour challenge! This week's colours are so fabulous together! Did anyone ever hear the saying "blue and green should never be seen except in the washing machine!"? That has always stuck in my head, despite the fact that I don't abide by it! I came across this patterned paper and just had to use it. I don't very often do stitching but I found it needed something more. The little flowers reminded me of the "eye" on a peacock feather, love it! Please head over and check out what Arielle and the design team have created as inspiration for you and then play along! Color Cue #10 - Our choice! When this months Color Cue gave us a range of combos I was excited and slightly overwhelmed. I wanted to do them all! But a couple really stuck out and one of them is this one chosen by Kerrianne at Retro Girly Creative. I also decided to get in on the flower challenge at CAS on splitcoast. I really like the look of things cut out off kilter and I am totally in love with the PTI distressed dots paper, so I married the two. When I popped up the black layer and placed the flower in the middle I didn't like the way it sunk in compared to everything so I raised it up too! Happy Thanksgiving to everyone celebrating in the US ! 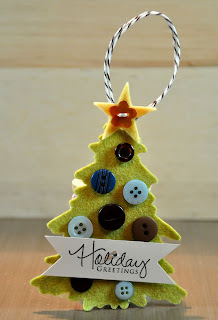 It has been a long time since I was able to participate in a PTI blog hop, They are always so much fun, and ALWAYS have such fabulous inspiration. 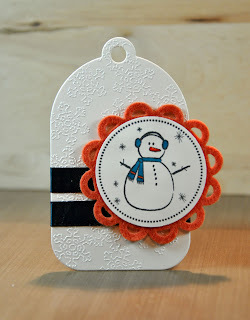 The Challenge this month was holiday tags. 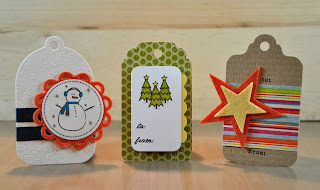 "Recently the design team and I put together a variety of holiday tags that are perfect to keep on hand for quick wrap options. Now it's your turn to inspire us and the rest of the Papertrey community! Design a holiday tag or two using all of your favorite goodies and share it with all of us! We will all have plenty of inspiration to create a large stash and try to get ahead of the hustle and bustle of the season!" This one was made with distressed dots paper, tree from tiny treats (which I masked off to create a "forest". The tag shape was cut out on my Silhouette. The tag was cut out with PTI's tag sale #2, the orange felt cut outusing one of the limitless layers dies and the stamp is from Holiday tags 2009. 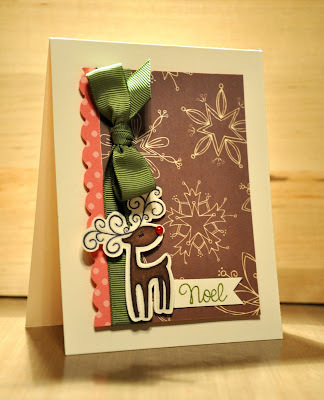 I stamped the background with the snowflake from Tiny Treats and then heat embossed with white powder. I know it's hard to tell in the photo but that ribbon is actually a really nice teal colour. 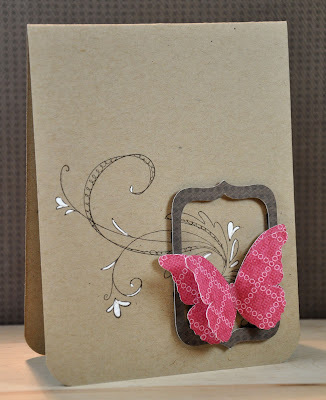 I cut the tag out of kraft cardstock with tag sale #1 then embossed with PTI's book print impression plate (LOVE IT!!!). 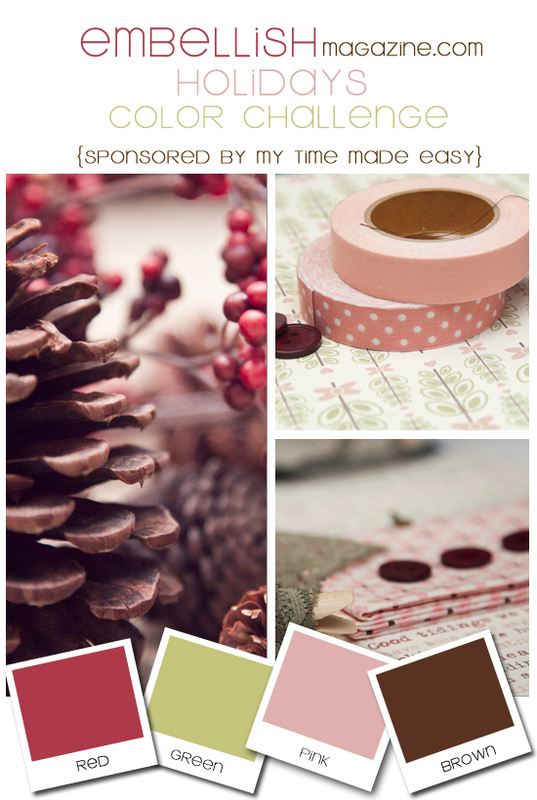 The patterned paper is my minds eye "colourful christmas" line. 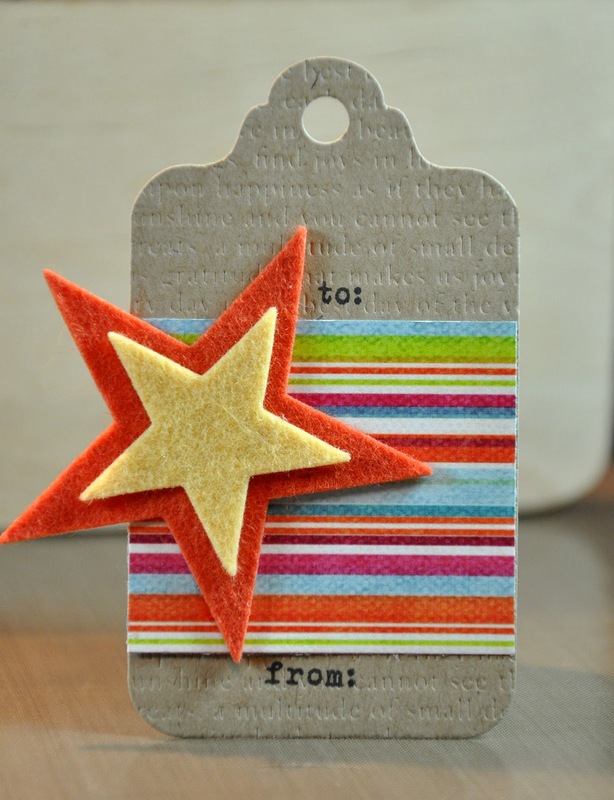 The stars were cut out in harvest gold & terracotta tile felt using PTI's seeing stars dies. 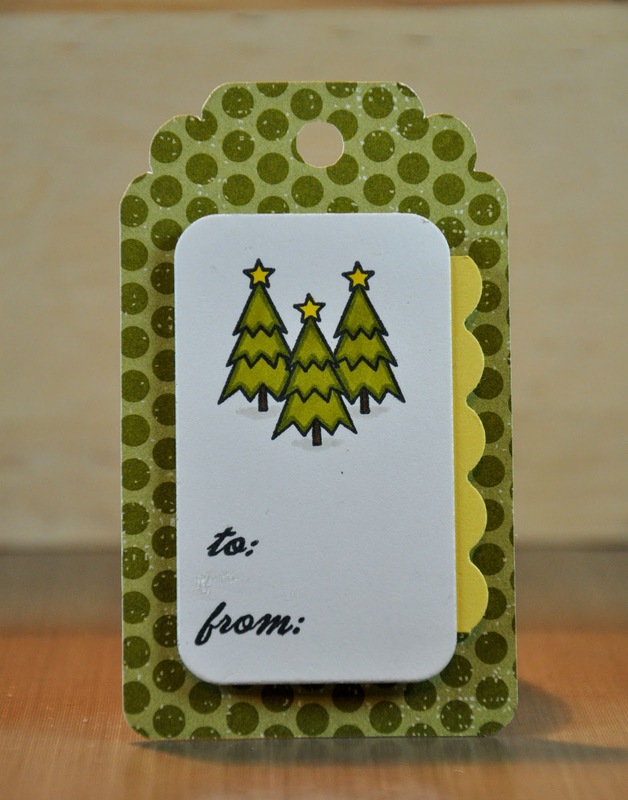 This final tag was cut from simply chartreuse felt with the christmas tree die. 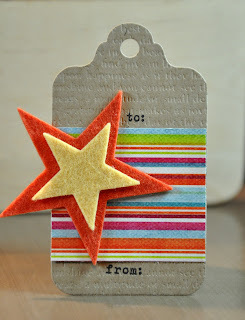 Maile Belles created this FABULOUS tag which totally inspired mine. The star was cut out with a PTI die then I cut it down to a smaller size more fitting with the size of the tree. I can't wait to hop and check out all of the fantastic tags. Happy Tuesday! 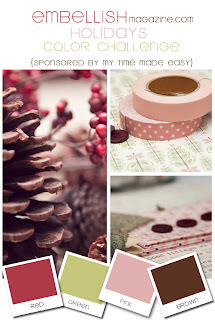 Are you ready for a fabulous ColourQ challenge combo? Arielle has come up with a great colour challenge this week, and boy do I just LOVE these mittens!! Don't they look super cozy? I am in love with all of the neutral colours in this combo. I took inspiration, again, right from the photo. Mittens seem to be all the rage this season, stamps, dies, stickers, everywhere. And since I have none of those things I created my own with my Sihouette. 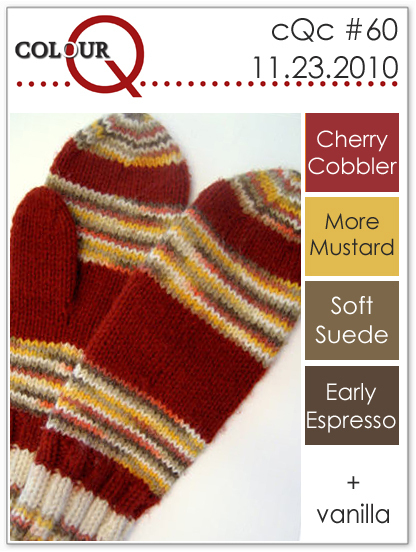 I found a mitten pattern I liked, cut it out from scrap paper then traced it onto PTI felt. 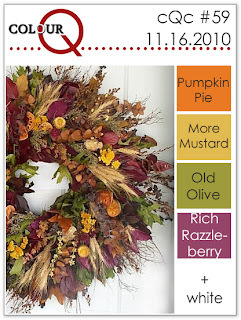 Head over to the ColourQ blog and check out what amazing creations Arielle and the amazing Royal Court has come up with! My hubby and I just had the most relaxing, do absolutely nothing important weekend. We walked the dog, checked out the progress on the new house, watched some TV, went out for dinner at a fabulous burger bar. It was GREAT after the last 5 months of go, go, go. For now it will be back to busy as we get ready to move yet again, plus throw Christmas in there! Fun times! 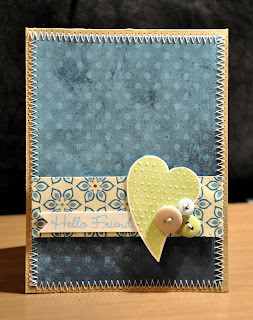 As I switch back over to nights, I managed to make a few cards tonight so I thought I would share one I made for the current Embellish magazine colour challenge. The patterned paper is Scenic Route (snowflakes), CTMH (dots), PTI vintage cream cardstock for the base. 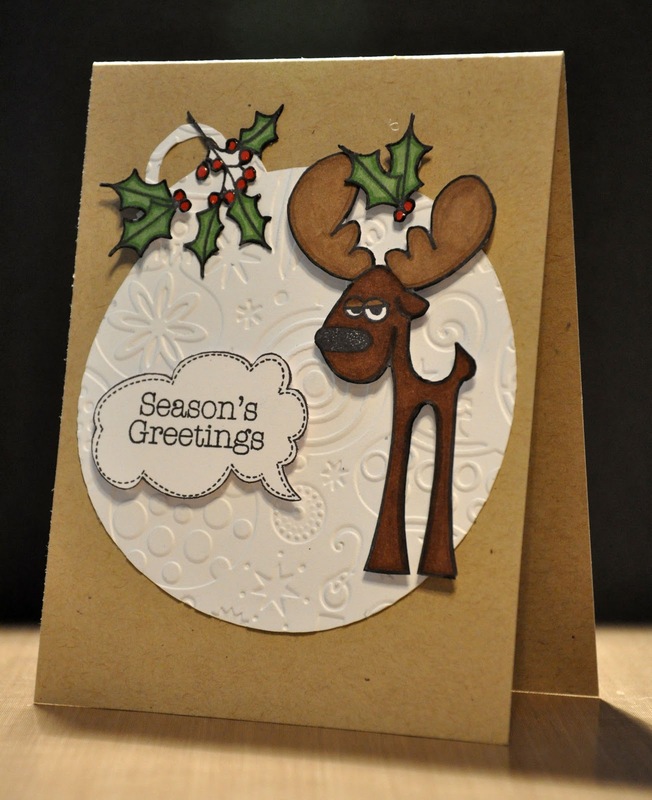 The reindeer is by Hero Arts and the sentiment is Kim Hughes for Cornishe Heritage Farms. That reindeer was screaming for a red nose so I used a red pearl, and then coloured him with copics. Hope everyone had a great weekend, thanks for stopping by! Winter is finally here. We have gotten our first snowfall that has stuck around, I think for good! I know I am probably waaaaay behind everyone else but the snow has finally gotten me into the Christmas spirit. So here is the first of many yet to come. I made it with this week's clean and simple sketch in mind. The main layer is supposed to be any shape but a basic one, ie circle, oval, square. The holly and moose are from a Kim Hughes Cornish Heritage Farms set. The ornament layer was cut out using my Sihouette and then embossed with a cuttlebug folder. The sentiment is Hero Arts. CQC #59 chasing away the gloomies! Good morning! Well we finally got some snow. Yesterday it was 9 degrees and it is now -6 and snowing! I suppose it's about time though. 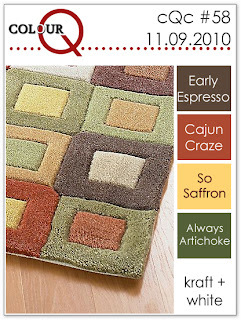 It's Tuesday which means another fabulous colour challenge over at ColourQ. 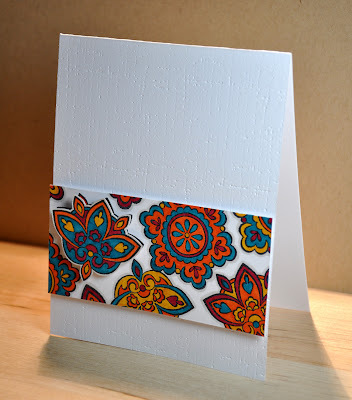 I recently got this awesome patterned paper from Papertrey Ink and just had to use it. The rest of the card sort of just came together after that. Please join us and play along. Good morning! I hope everyone had a great weekend. I spent mine visiting one of my best friends who lives in B.C. and currently pregnant. It was fantastic, but it definately started my biological clock ticking! This weeks ColourQ challenge colours are amazing as usual! Arielle has picked some fantstic colours. I thought they were sort of subdued and unfortunately I needed to make a sympathy card, a friend of mine's father passed away this weekend. I was able to get my hands on this beautiful Hero Arts stamp, long stem flowers, I have admired it on so many other cards! 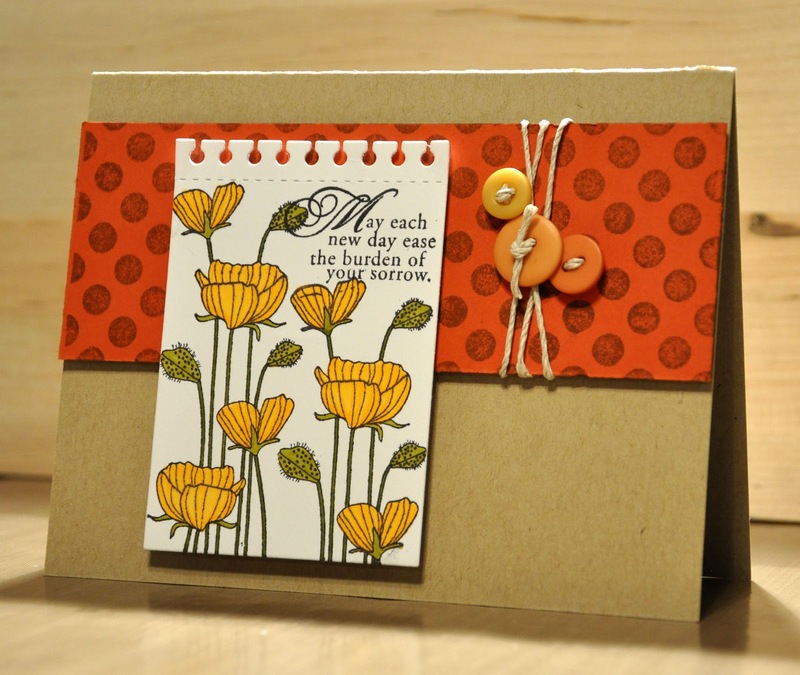 The polka dots stamp is by Cornish Heritage Farms, the sentiment and papers are Papertrey Ink. 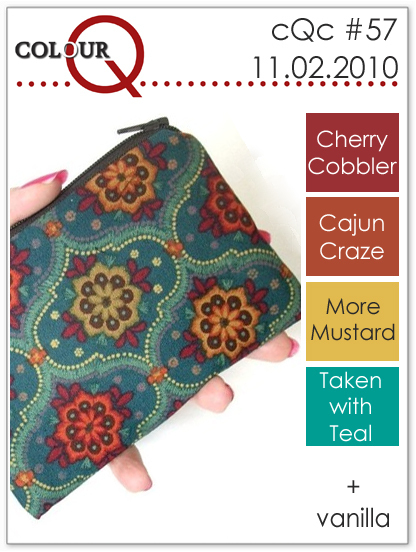 There is always fabulous inspiration from the design team to check out so please do over at the ColourQ blog, then play along! I was cleaning up my craft space, which is currently the dining room of our temporary living quarters, and I was astounded at how large my scrap bin was. 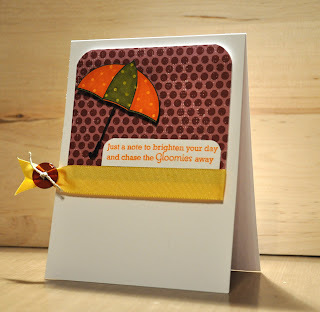 So I picked up a few scrap pieces and made this simple little card. The frame was one I cut out with my Silhouette that ended up being to small for what I wanted. 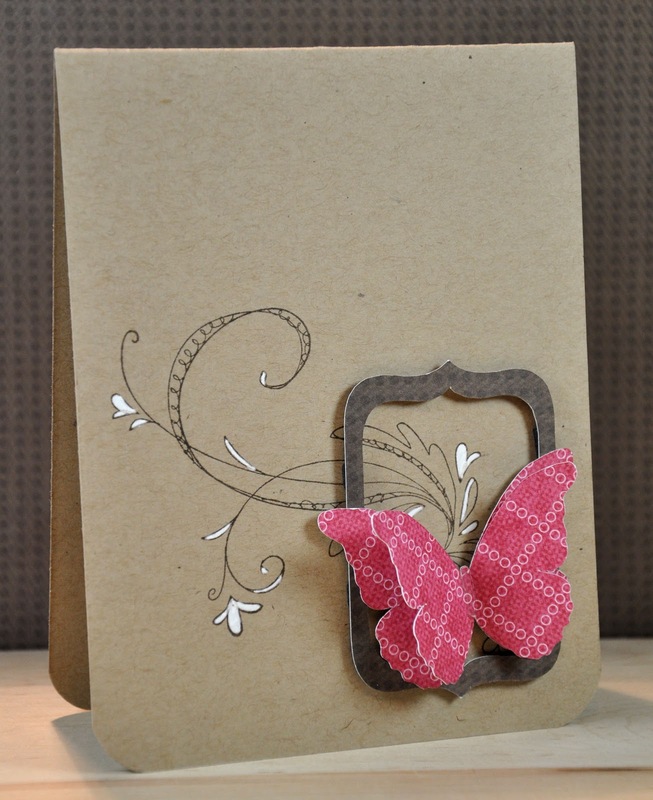 The butterflies are the middle pieces I cut out from the frame I made in this card. I coloured in a few spots on the flourish with a white gel pen. I'm going to try to use up more scraps over the next little while, although it would take years to make a dent! I hope everyone had a fantastic Halloween weekend! We moved recently and I thought for sure we would get a lot of trick or treaters, but we only got 3! And boy did those 3 hit paydirt! Oh well, next year we will be in a new community with plenty of kids. I love seeing what creative costumes come to the door! 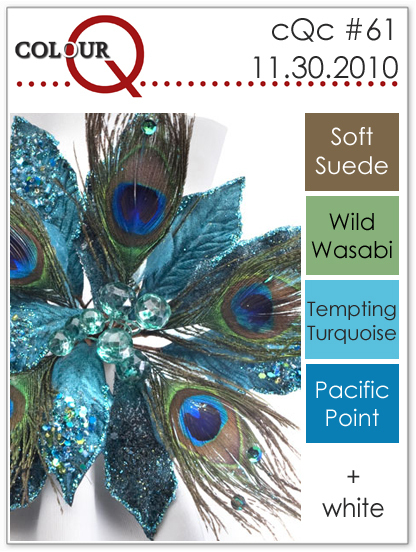 Well it's Tuesday which means another fabulous colour combo over at ColourQ. For my card I took inspiration from the change purse in the picture. I used a stamp set by Close to My Heart and had a lot of fun colouring it with my copics! 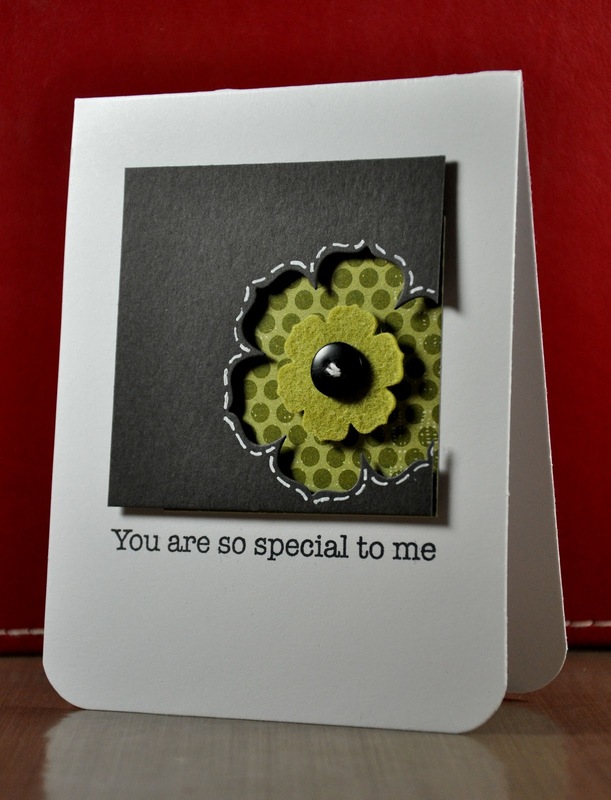 ﻿The background was embossed with the linen impression plate from Papertrey Ink. The ColourQ design team has made some AMAZING cards this week to inspire you. head over and check them out, then play along!